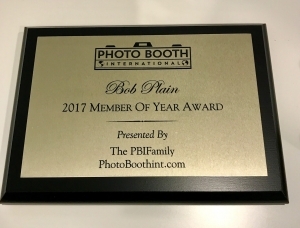 Photo Booth International is proud to award Bob Plain with our PBI Member of the Year Award. 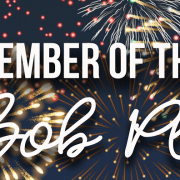 Bob has been a part of our PBI Family since March of 2017 and was voted the biggest contributor in our PBI Facebook Group by our members. We want to thank Bob for all the great help and feedback that he gives to our PBI Family. 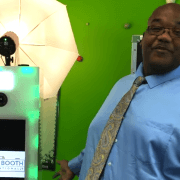 We can’t thank him enough for the great tips and tricks that customers can apply to their own Photo Booth Businesses. Bob is always very active in our Facebook Group but we interviewed him to learn more about who he is so we can share with our community. Aside from owning his own photo booth business, he also provides DJ services and works a full time job at Methodist Hospital in Peoria, IL. He has been a DJ for almost 11 years; working events such as weddings, school events and many other social gatherings. What made Bob want to get in the photo booth business you may ask? He explained that he is always looking for ways to improve his services. One night, he was observing another DJ at a wedding to see if there was anything he could learn from him that he could apply to his own business. While he wasn’t very impressed with the DJ’s skills, he did notice that the DJ had his own photo booth. 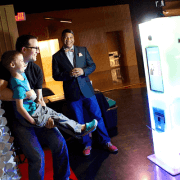 In that moment, he decided that it only made sense for him to integrate a photo booth into his existing service. 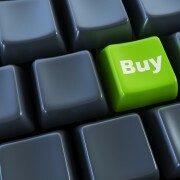 Bob says it is the best decision he has ever made! Since he bought his booth, he says that he books an average of 1 to 4 gigs a month depending on the season and the number of bookings is steadily increasing. We asked him how he knows so much about computers and the booth software, Bob explained that he is still learning every day just like the rest of us. He says a lot of his knowledge came from watching one of his friends work on computers with different programs. He then practiced what he learned by working with different programs on his own and that gave him the experience to develop his computer skills. Nowadays his friend who he learned from calls Bob for help and advice! Bob also enjoys helping friends and family with any computer issues that they might encounter. He started working on his first computer back in 1999 with Windows 98. Bob now builds his own computers from scratch, and uses multiple different programs on them. He currently has 16 running computers and 5 tablets at home. He does say that he needs to get more familiar with Windows 10 but is learning the ins and outs day by day. 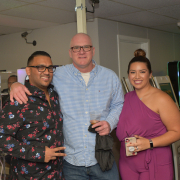 Even though it seems like Bob knows the answer to every question that is posted on our Facebook group, he says that he is still getting familiar with the Photo Booth; learning new tricks all the time. He started getting comfortable with the photo booth and software within a couple of months upon receiving it. He says that one of the ways that has helped him learn more about the photo booth is by helping people out and resolving some of those issues himself. Upon receiving his booth, it took him about a month to land his first gig. He received his booth back in May of 2017 and landed his first gig in July 2017. 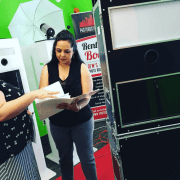 The biggest tip that Bob recommends to anyone in the photo booth business or something thinking of getting into the photo booth business is do your homework, learn as much as you can about your equipment. Ask questions, don’t hesitate to ask. Give your clients the best service that you can because they will always remember the specific day and moment that you worked at their event. 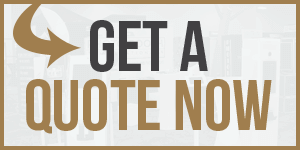 Imagine working at a wedding and you work your photo booth at that wedding, the bride is going to remember her guest having fun and enjoying your photo booth if you give them top quality service. Bob is the perfect example of what hard work and dedication can accomplish. He is working toward his goals every single day and that is inspiring. Bob, we wish you continued success in all that you do! 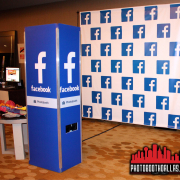 Ready To Start Your Photo Booth Business?